A long time ago a fellow San Diego blogger was gifted a Kitchenaid stand mixer and asked me for a mixer-friendly brioche recipe. This is probably a few months late but…. 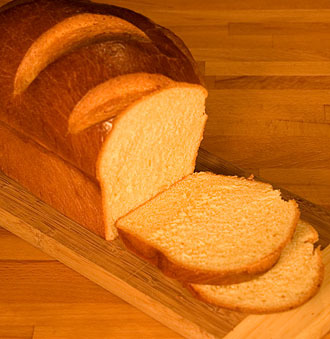 Brioche is an enriched French bread with a large amount of butter and eggs that gives this bread a soft, sweet crumb. 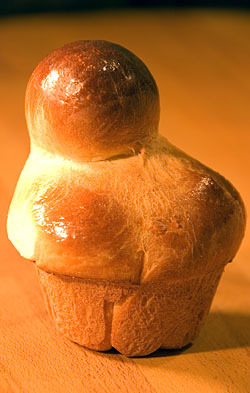 Brioche are formed into many different shapes but the brioche a tete is probably the most widely known. They’re usually cooked in small fluted pans with an extra small bun on top. You can see here that I had my best go at the ‘a tete’ variety. I didn’t have access to the small fluted pans so I used a large muffin pan and tried and stay with the theme. They don’t quite look as beautiful without the fluted sides but the muffin pan worked in a pinch and produced a reasonable facsimile. What many people don’t know is that brioche is made into other shapes including plain old loafs of bread. It seems like brioche should deserve a better fate than a normal loaf, but on the contrary, it is as a loaf that it really shines. When baked as a loaf it can be transformed into some really rich French toast, a mean bread pudding, or just the best slice of white bread and jam you’ve ever had. This is a recipe that I learned while I was a student at the San Diego Culinary Institute. Our instructor, Yves Fournier, an accomplished pastry chef, was the son of a baker in France. Yves would always give us practical baking tips, whether it was the correct way to shape baguettes, form croissants, or make brioche, he was always full of useful baking knowledge. While we were learning how to make brioche, Yves showed us an alternative way to make this rich dough using a commercial mixer. This recipe is a little different than a lot of the brioche recipes you will see out there; don’t worry, it works just as well (or even better). Dissolve the yeast in a small amount of warm (100F) water. You don’t need much water here, just enough to get the yeast to dissolve. Combine eggs, sugar, yeast mixer, and all the flour in the work bowl of the mixer. Mix using the dough hook until all the ingredients come together. Add salt. At this point you will need to adjust the consistency of the dough. If the dough is too tough, adjust consistency with a little more water. If the dough is too wet, add enough flour until you have a soft, tacky dough. Add all the butter to the dough and continue to knead until the dough absorbs all the butter. You may still need to adjust the dough with a little more flour. It is ok to have a sticky dough but it should still be able to hold it’s shape somewhat. Remove the dough from the mixer and form into a tight ball. Place dough in an oiled bowl and refrigerate the dough overnight. When ready to use the dough, remove from the chiller and allow to return to room temperature. Let rise until dough has doubled in size. Punch dough down and shape into loaves, buns, or whatever you desire. Proof shaped dough until doubled in size. Brush egg wash over the tops of the dough and bake at 375F for about 25-35 minutes and golden brown. Of course, you could also go to the following websites that also offer a brioche recipe for the kitchen aid without the pesky bother of interacting with the diversity inherent in the outside world. Then again, diversity is the spice of life. Get over the inconvenience. Hello, just wandered by. I have a Kitchenaid site. Lots of information out there. Wasn’t exactly what I was looking for, but very nice site. Take care. Stupid non-standard units of measure and bad internet conversions. Previous comment retracted. Ted’s post seconded. This brioche dough isn’t much like a bread dough at all. The dough is very rich and very soft. I used this exact recipe to make the buns in the post. I noticed you said TWO Cups of flour, which is incorrect. 500g of flour is roughly equal to about 4.25 cups of flour. Anyone actually try and cook this?? 6 eggs, and only 2 cups of flour yielded me a dough that was NOTHING like bread dough….that can’t be right! Now I have to change it to a recipe that works. I wish you would translate this recipe to cups, teaspoons, etc. 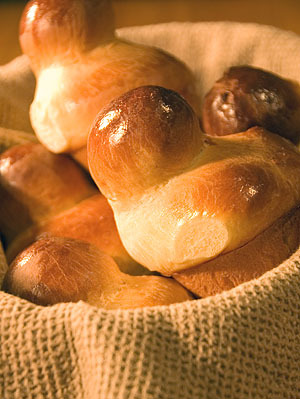 okay – that previous comment was for the potato bread :D.
I love those little brioches in the basket—so adorable. Your loaves look fantastic especially the braided one – i have never done one of those! hell yeah! you totally hooked it up for me. a man of his word. 🙂 i can’t wait to give it a whirl.